Much is made of signatures (typically for good reason!) 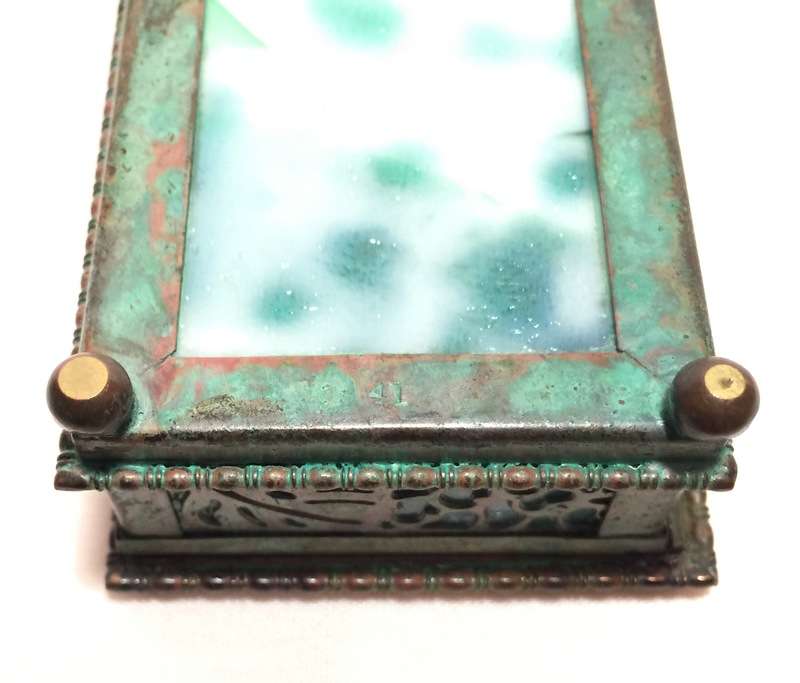 in the world of Tiffany Studios desk set pieces, but with light research and deduction, it can be fairly easy to make sense of what seems to be anomalous. 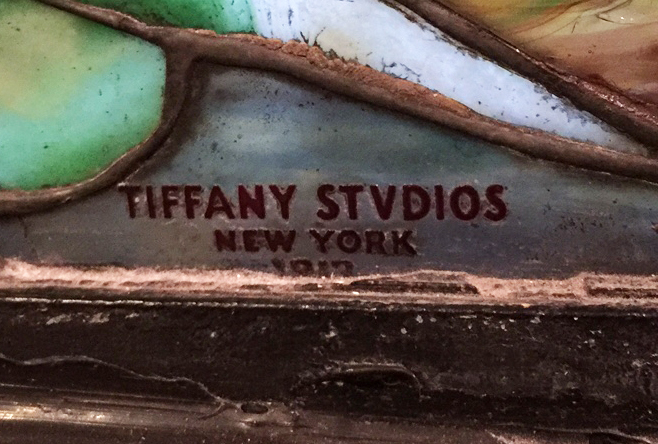 Most Tiffany desk set pieces bear a three or four-digit registration number along with the “TIFFANY STUDIOS” or “TIFFANY STUDIOS NEW YORK” stamp, while others are simply marked with the studio name. Three and four-digit numbers correspond to individual items. 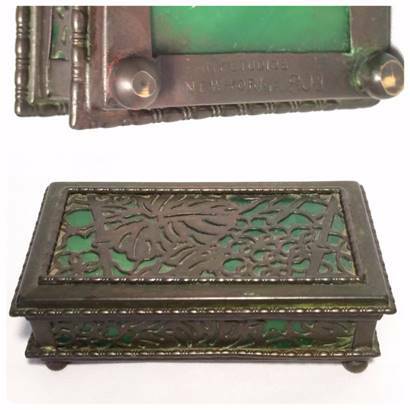 For instance “801” refers to Etched Metal & Glass (Grapevine or Pine Needle) stamp boxes. What confuses some people are the pieces with two-digit numbers. Apparently the two-digit numbers were used for assembly, as many of Tiffany’s desk items were complicated and constructed of multiple pieces. The separate pieces typically bear an assembly number somewhere, usually hidden once constructed. 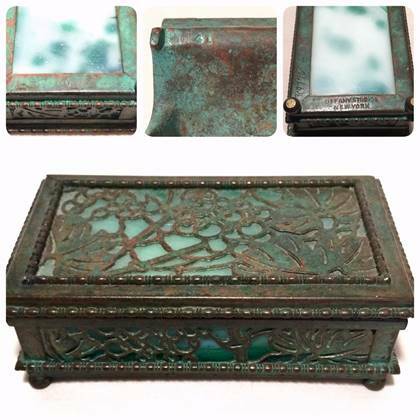 Above is a Tiffany Studios stamp box in the classic Grapevine pattern, with registration number 801. While signatures (or lack thereof) are not the sole defining characteristic of Tiffany desk set pieces, a basic understanding of them can easily help a collector choose pieces that are correct but seem anomalous or, on the other hand, avoid pieces that do not coincide with any published information. Lot #79 was top lot of the French glass section of the sale. 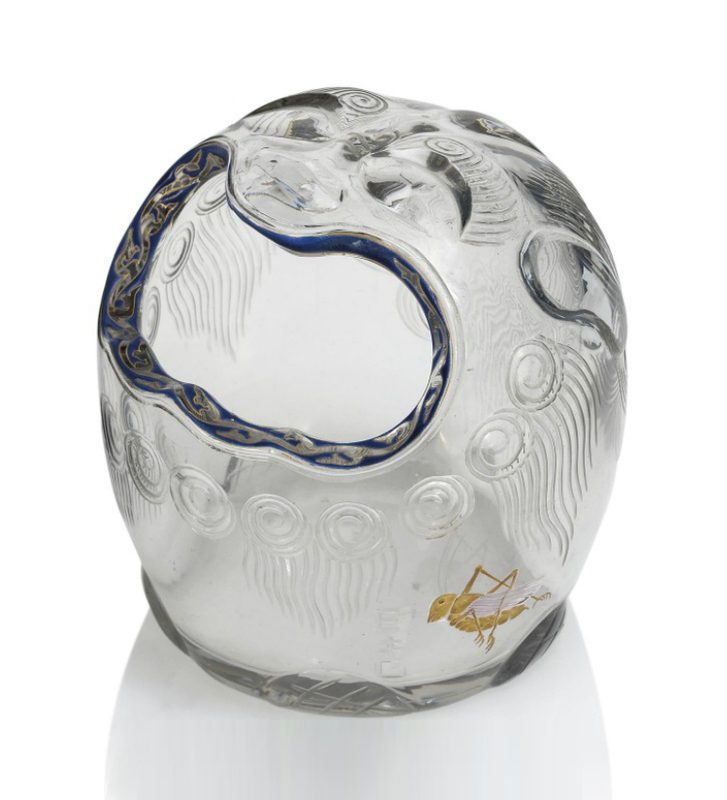 It was a rare, early, wheel-carved, enameled, clear glass, 5¼” Gallé Foo Dog vase, in the Japanese style and taste. It soared well beyond its pre-sale estimate of £5,000 – £8,000, realizing £37,500 ($54,225), including buyer’s premium. Surely this vase will be going to Japan. I had no interest in it, as Americans wouldn’t pay a plugged nickel for it. 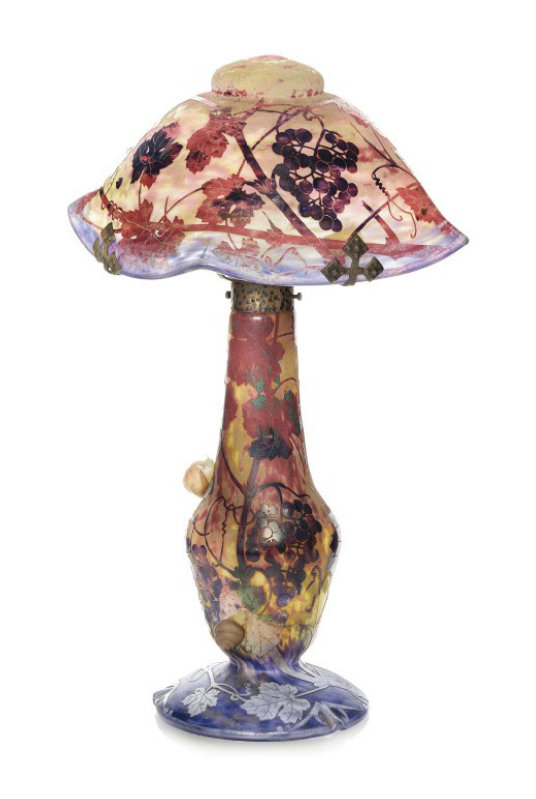 A rare and very desirable Daum lamp with applied snails was in the sale. It easily surpassed its pre-sale estimate of £12,000 – £15,000, realizing £23,750 ($34,343), even with important condition problems. Here’s an excerpt from the condition report. One snail has been off and re-glued back on and it has a chip/loss to one antennae and a small chip on the end of the shell. The other snail has a tiny chip on the end of its shell. I had no interest in the lamp at any price. The sale included two excellent, internally decorated Burgun & Schverer (B&S) vases, both of which I wanted to buy. Unfortunately they exceeded my budget. 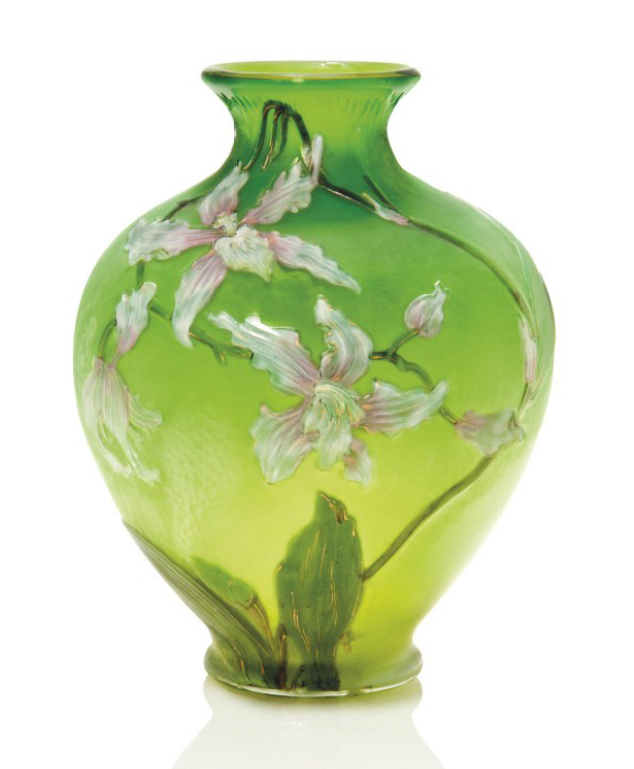 Lot #118 was especially nice, 8¼” tall, with beautiful clematis flowers, on a striking chartreuse green background. It sold well beyond its pre-sale estimate of £2,500 – £3,500, realizing £12,500 ($18,075) — pretty close to what I feel is the retail price. Now for a little shameless self-promotion. A good part of the reason people buy from me is that I do the very important vetting. I search for merchandise at auction, privately and through extensive traveling. Then I weed out all the items that are inferior because of design, color, condition, price, or any combination thereof. If I’m selling it, it’s passed my smell test and that means a lot to many people. During the taping of an episode of Antiques Roadshow, expert Stephen Fletcher of Skinner Auction, Boston, MA, gave the good news to a guest of the show. 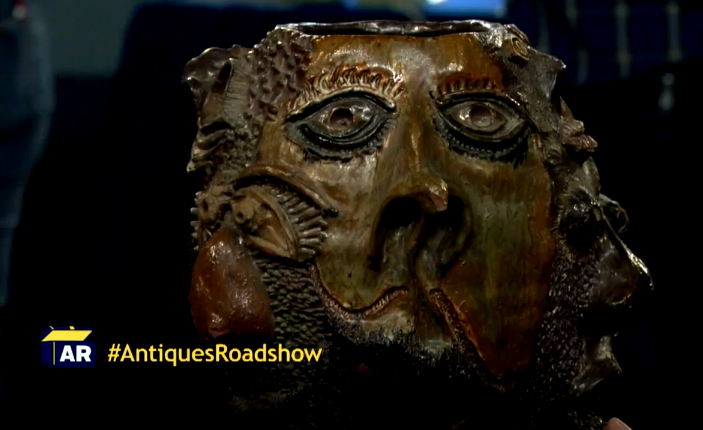 He told the guest his vase dated from approximately 1900 and was worth $30,000 – $50,000. The only problem was that he was wrong. A high school student had made it in 1973 as an art project. Ouch!! For the AOL video of the story, click here. Then click here for more of the story from the Washington Post. 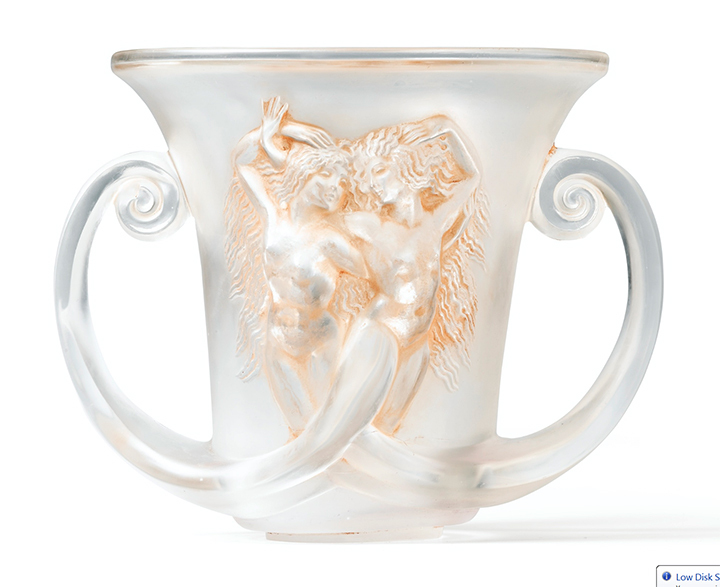 Leslie Hindman Auctioneers held a Modern Design sale on May 12, 2016, with some good results. 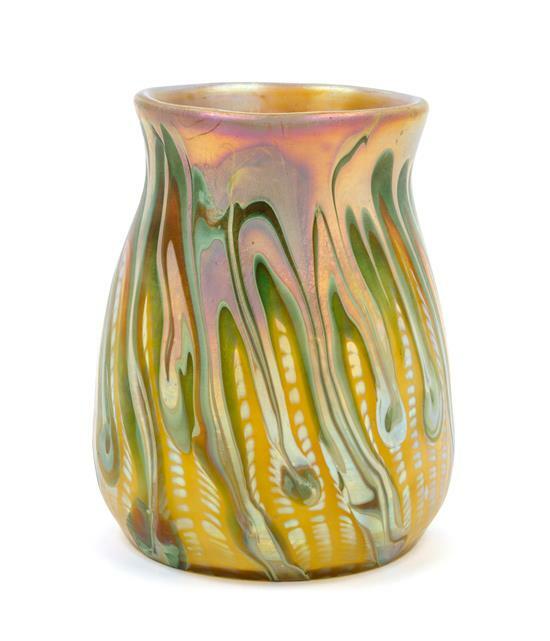 Lot #267 was a rare and desirable 6¾” Loetz decorated Phänomen vase, property of the estate of John P. Landis. It flew past its pre-sale estimate of $4,000 – $6,000, bringing $20,000, including buyer’s premium. I knew how rare it was so I was on the phone bidding, but I never even got to make the first bid — way too much for a dealer. Left, Hindman lot #494. Right, the original candlestick. 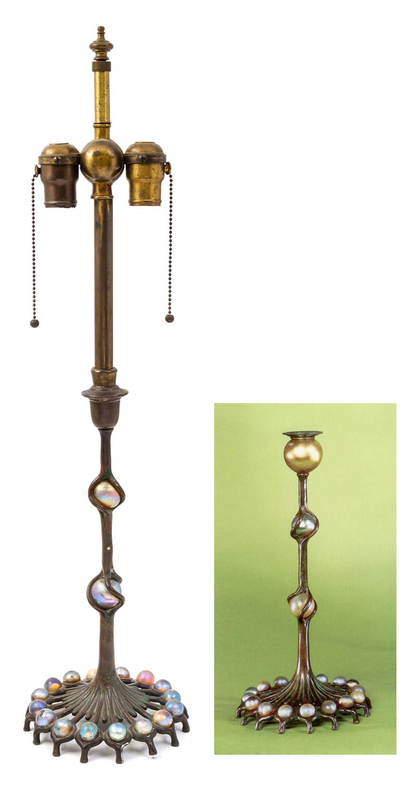 Lot #494 was a rare Tiffany Studios candlestick that needed professional help. Regardless, it easily exceeded its high estimate of $12,000, realizing $17,500, including buyer’s premium. Someone had converted it into a ridiculous lamp by removing some original parts and adding modern parts. With the right professional help, it’s possible to find original parts and return it back into its original state as a candlestick. Almost surely that’s what’s going to happen. Nobody in their right mind would pay $17,500 unless they could do it. Should be worth $35,000+ when it’s done. 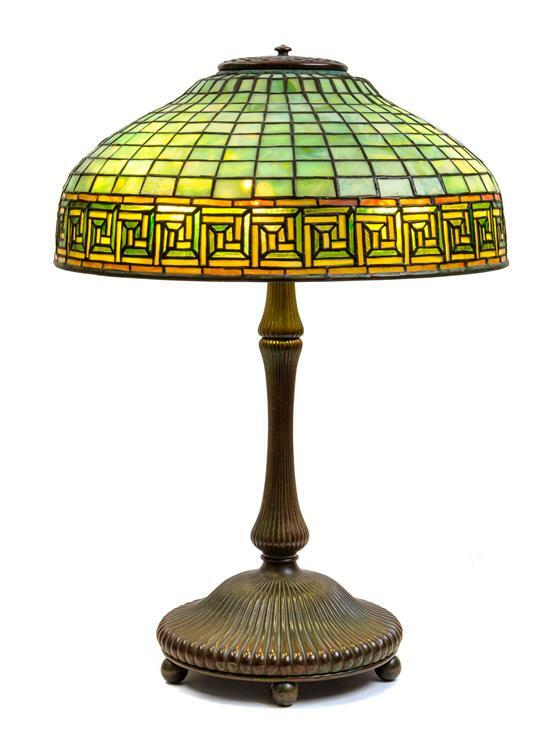 A Tiffany Studios 16″ diameter Greek Key table lamp, lot #495, brought a decent price. It sold within its pre-sale estimate of $15,000 – $25,000, realizing $23,750, including buyer’s premium. 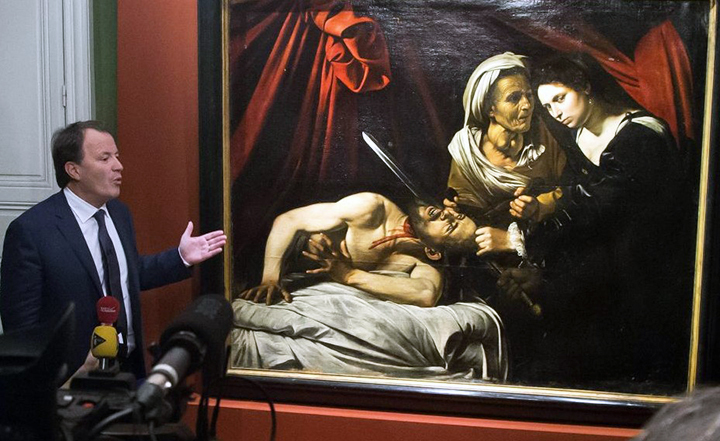 Can you imagine going into your attic and finding a painting worth $137 million? It won’t happen in my attic, nor yours, I imagine. But in April, 2014, it did in the attic of a private house near the French city of Toulouse, 400+ years after being painted. For the CNN story and video of the discovery, click here. 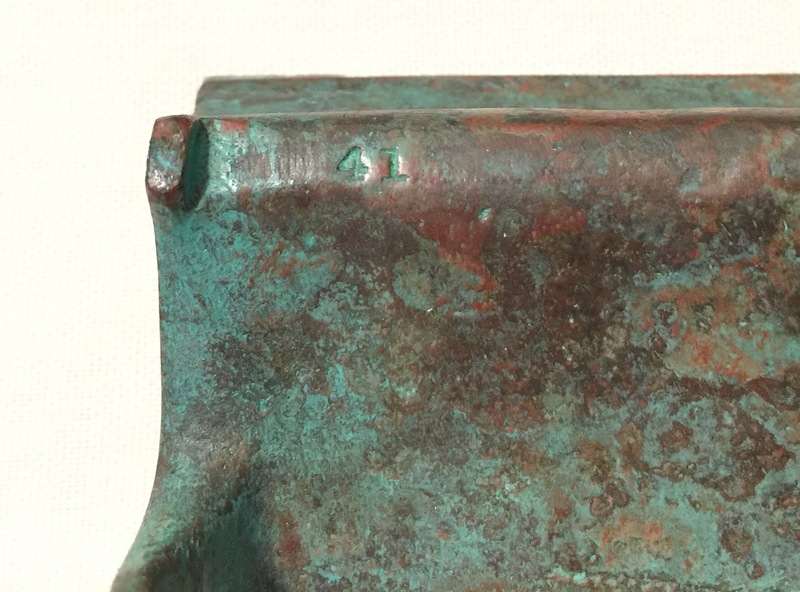 Then click here for the artnet news story of the authentication. Heritage Auctions held an Illustration Art sale on April 26, 2016, with total sales of $1,695,956. Included in the sale were several pin-up paintings by acclaimed American illustrator, Gil Elvgren. His works regularly sold for over $100,000 at auction, with six selling for over $200,000. The average now seems to have cooled into the $60,000 range. The top lot of several Elvgren paintings at the April sale was #71051, a painting entitled Roxanne, from 1960. It sold well below its pre-sale estimate of $100,000 – $150,000, realizing $68,750, including buyer’s premium. The next lot, #71052, was the second best Elvgren of the sale. It sold within the more realistic estimate of $50,000 – $70,000, realizing $62,500, including buyer’s premium. Three other Elvgren paintings in the sale sold from $47,500 to $60,000. It could be a bear market in Elvgren paintings or a great buying opportunity. Only time will tell. 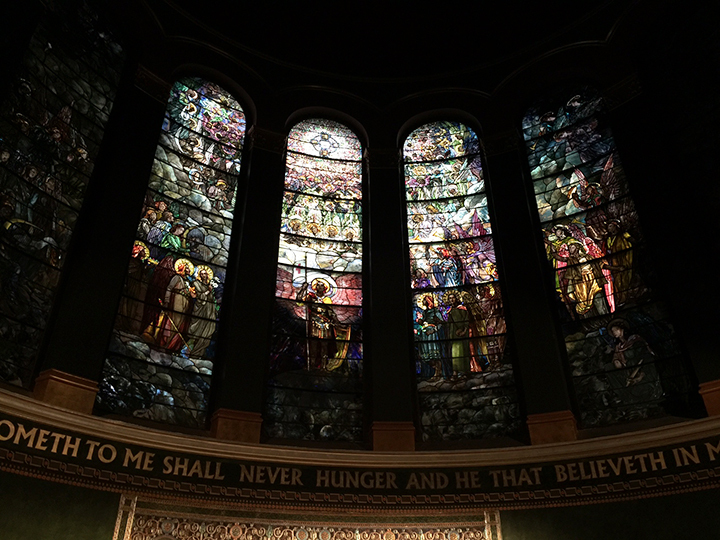 The Art Glass Forum holds their monthly meetings at St. Michael’s Church on W. 99th St. in New York City. It’s the perfect venue for a glass collector’s club, many of whose members collect or sell Tiffany Studios Favrile glass and lamps. 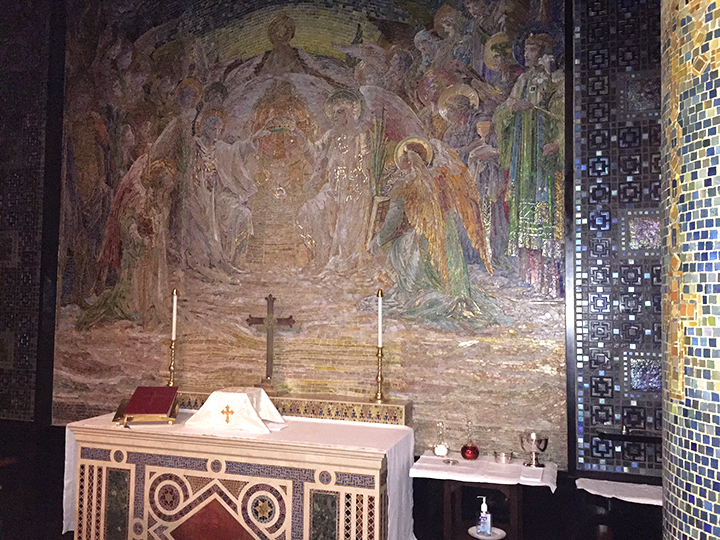 Much of the interior of the chapel was designed and made by Tiffany Studios. It’s a gorgeous and fitting location. 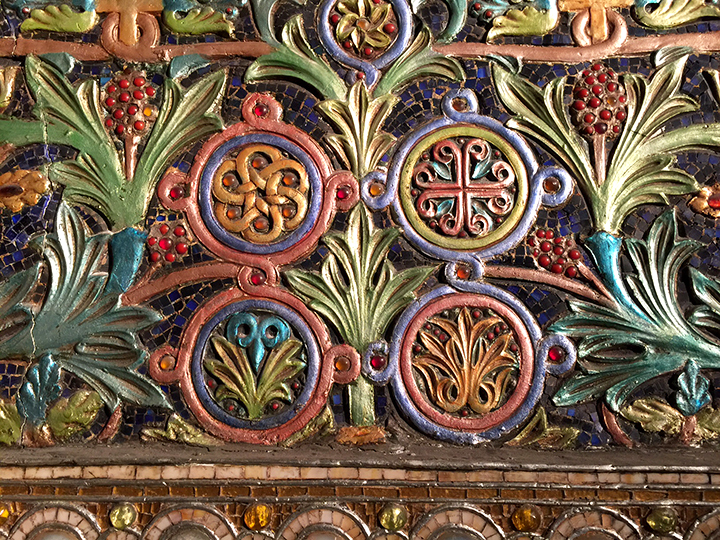 Yesterday’s meeting included a lecture by Amy McHugh, the assistant archivist at Tiffany & Co., entitled Cabinet Curiosities: Silver-Mounted Favrile Glass by Louis Comfort Tiffany and Tiffany Studios. 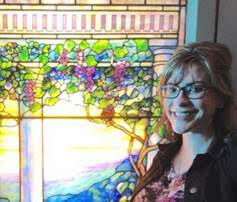 She researches their extensive archives, which include some collaborations with Tiffany Studios. 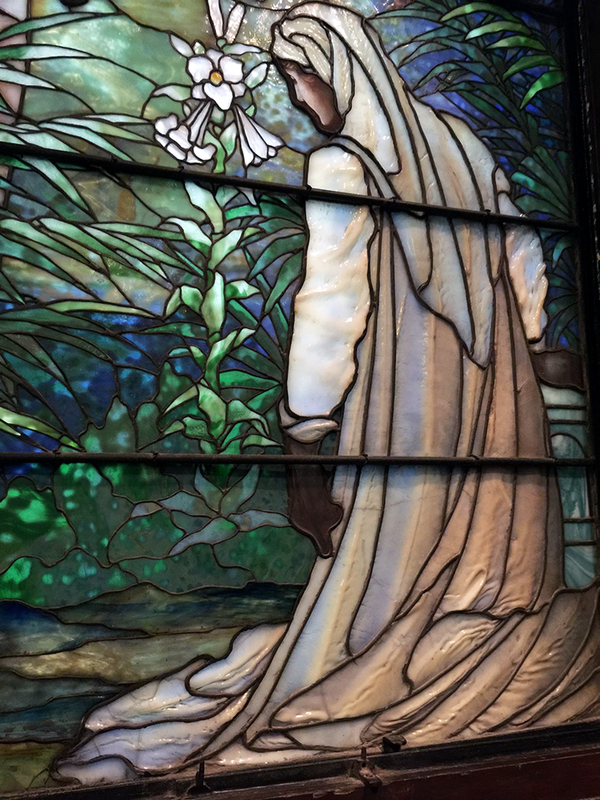 (Charles Lewis Tiffany was one of the founders of Tiffany & Co. and the father of Louis Comfort Tiffany, founder of Tiffany Studios.) Amazing what you can learn at one of the lectures. Membership in the Art Glass Forum is open to the public. Yearly dues are quite reasonable, $70 for individuals, $90 for households and $25 for students and young professionals. If American or European art glass interests you, why don’t you join and attend the lectures? Contact artglassforumny@gmail.com. They accept PayPal, checks, shekels, whatever you like. EJ’s Auction & Consignment, Glendale, Arizona, held its Biltmore Estate Auction Ring 1 this past Saturday, April 30, 2016. 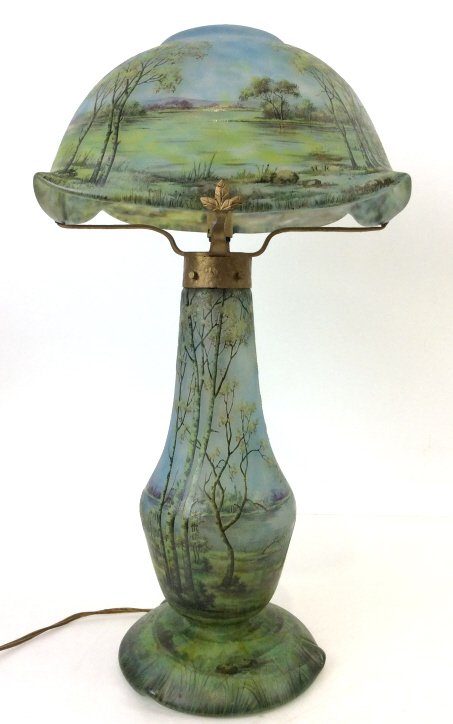 Included in the sale was a wonderful Daum Nancy table lamp, lot #1100. 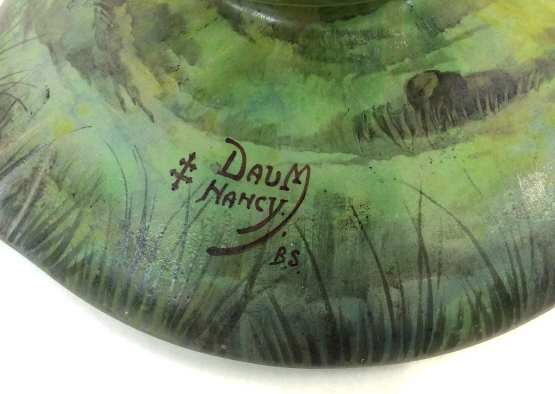 The lamp was special, mainly because it was painted by Daum’s best artist, B.S. (See my post dated July 6, 2015 for more on this artist.) 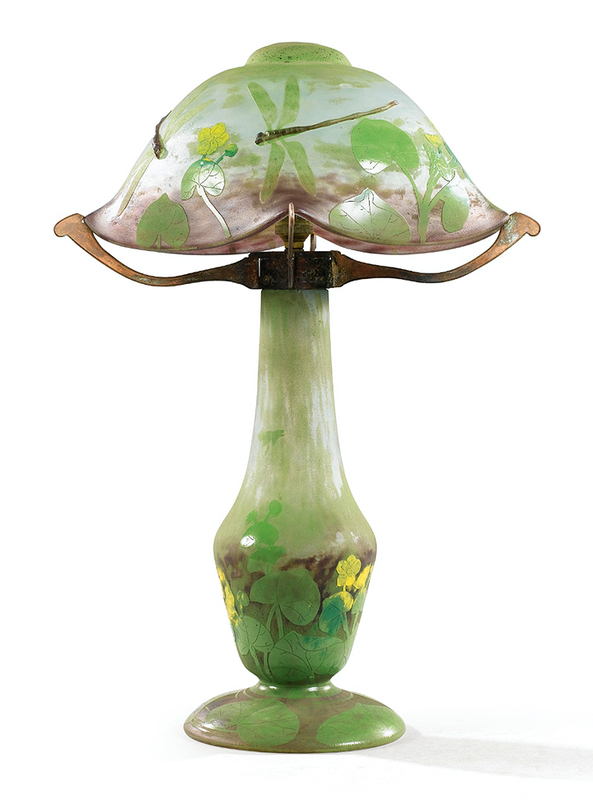 At 19″ tall, with a 9½” diameter shade, it was one of the larger Daum Nancy table lamps. I really wanted to buy this lamp, so I set up telephone bidding. The bidding opened at $11,000, picked up steam, and finally settled at $22,000, for a final price of $25,960, including buyer’s premium. I was left in the dust, and unfortunately not the buyer. $25,960 was a fair price for a retail client, but not a dealer. Kudos to the buyer of this exceptional lamp.